If you've been looking for a Cyprium French Link Eggbutt Snaffle Bit, You came to the right place. This specific model of Flat Ring Eggbutt Snaffle Bit happens to be one of our best sellers due the it's impecabble craftsmanship and affordable pricing. This Cyprium French Link Eggbutt Snaffle Bit prevents pinching of the horses lips as the mouthpiece remains stationary on the rings. The Cyprium Horse Bit also remains somewhat stationary in the mouth which allow for good mobility within the mouth preventing palate irritation. Snapping relationship between rings and mouthpiece keeps the mouth moist. 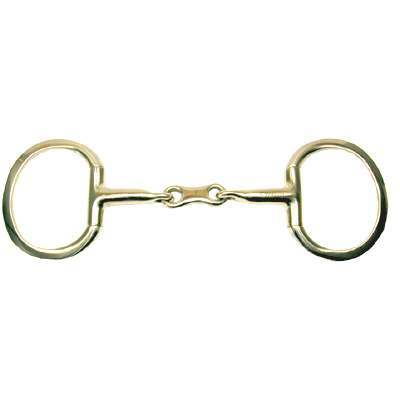 As horse enthusiasts ourselves our number one priority is to offer our customers French Link Eggbutt Snaffle Bits which we believe are made to last and available at affordable prices.This item measures 3'' rings and 12mm mouth.